Explosive. Addictive. Seductive. An instant olfactory detonation of masculine sensuality from Viktor&Rolf. An eau de toilette and an after-shave balm. An addictive and seductive eau de toilette set he will love. A necessary toolkit for the daring man. Spicebomb is an instant olfactory detonation. An overturning convention which reveals a fragrance that makes no concessions. 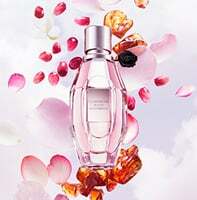 An explosive concentrate of masculine sensuality. The bottle, a reworked custom-built grenade for a perfume made up of explosive scents, is encircled by a black band that cannot contain the force of the fragrance. An olfactory explosion is ineluctable. An explosive encounter between two accords with detonating tones: the first is a heart of incandescent spices – chilli and saffron – with the all-masculine roundness of leather and tobacco, along with the distinguished brute strength of vetiver. The second is explosive, fusing fresh zesty notes of bergamot and grapefruit, while cold spices – elemi and pink pepper – leave the mark of their icy bite. A seductive fragrance for everyday use.